Editor’s Note: This is the tenth in a series previewing Penn State football, part of Onward State and StateCollege.com’s countdown of insight and analysis about head coach James Franklin and his team heading into the Blue-White Game on April 12. Read the previous stories here. For a player, spring practice is all about getting down schemes and technique, all the little details that can make the difference between starting off a year on the right foot or stumbling out of the gates. But for a coach still in his first year at a new job, spring practice is the first chance that coach will get to see his players in person. You can watch film, tape from the year before, read the stats, but nothing beats hands-on experiences with your players. And that's a big part of what new Penn State head coach James Franklin is doing this spring. "I think the hands-on experience is the most important thing," Franklin said heading into spring practice. "A lot of times you watch a tape and you're not sure what they're being taught. What the techniques are, the fundamentals are and what they're really being asked to do in the scheme, so that is the most important thing. But, yeah, we did go back and watch tape: offense, defense, and special teams." While Franklin might value the time he spends with his team in person, there is still a lot to learn about Penn State just by watching the film. The most obvious unit to watch is special teams, something former head coach Bill O'Brien patched together with walk-on players and Nittany Lions a little lower on the depth chart -- largely with the hope of keeping the team healthy through NCAA sanctions. The hard hits and full speed contact on special teams is a hot zone when it comes to injuries. That won't be how Franklin does it though, if you're good and you're healthy, you might hear your name called on special teams. "If you look at us statistically the last year or so, it's the area for most improvement, I think," Franklin said. "It's the area that we can make the biggest impact, and we're committed to playing the best players on special teams. I think it was a little bit different philosophy in the past, and I think that dealt with the sanctions and things like that. That was a way they were going to try to solve it with the sanctions. I don't believe in that. I believe we're going to play our best players." Franklin's approach to special team's should be an interesting one after the O'Brien era unit saw linebacker Gerald Hodges returning kickoffs for at least one game. 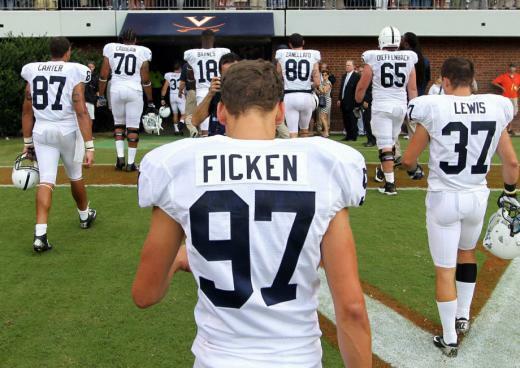 Kicker Sam Ficken will also be in the cross hairs as the now third-year placekicker has seen his fair shares of ups and downs throughout his career. O'Brien was strongly planted in Ficken's camp his entire tenure at Penn State but those allegiances will have to be earned by everyone on the roster now that there is a new sheriff in town. "I think a lot of times coaches give special teams lip service. I'm not saying that's what's happened here in the past, but I believe you're going to play your best players in all three areas."